When I finish telling you about this, you might believe this stageplay should have been a movie. For the record, if you do think this, you are wrong. The fact is seems like it should be a movie makes an essential part of the delerious fun! 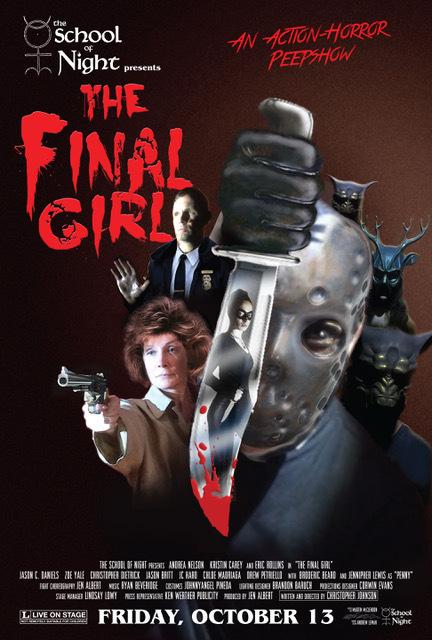 The Final Girl takes its title from a trope in all those 1980s slasher flicks. Remember that one girl in the end trying to get away from the masked maniac with a knife or an axe or a scythe or something? She's the hero of this show. 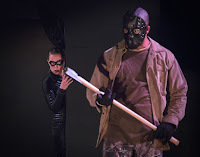 In fact the play is a virtual sequel to every single one of those flicks, but re-imagined not as simply another slasher film but a superhero origin story! Victoria (Andrea Nelson) alone survived a spree killing that killed her family and friends. Seven years later, we meet the almost frighteningly focused young woman she has become, among other things an impressive martial artist. Her former therapist Dr. Harriet Lewis (Kristin Carey) turns out is worried about her. She has reason, since Victoria is moonlighting as a vigilante hunting down explosive psychopaths who escape from prison or asylums to go on brand new killing sprees. So when Wayne Walton (Eric Rollins) breaks free to return to his hometown, Victoria dons her own mask to follow. Okay that sounds like a fun, straightforward Holloween fare, but believe me the twists come fast and furious. The whole story has a very dark (and funny) sensibility, not least how Victoria's personal "kink" involves the masks of those psycho killers she's killed. Plus the cliches that do backwards sommersaults in all sorts of entertaining ways. The fight scenes prove absolutely spectacular, sometimes with the help of black-clad stage hands who move things "unseen" by the cast. It helps also the cast proves so uniformly high quality, up to and including the seemingly innocent college kids who've gone to have a relaxing weekend in a hunting cabin miles from anywhere right after the psycho killer has escaped (Jason Britt, Zoe Yale, Juan Carlos Haro, Chloe Madriaga, Andrew Clark). This show is one of the most fun and original I can remember, zany and yet adult, over-the-top yet somehow real, dramatic yet hilarious. Strongly recommended. Really. I mean it. The Final Girl plays Fridays and Saturdays at 8pm, Sundays at 7pm until November 4, 2017 (with a special performance Halloween Night at 8pm) at the McCadden Place Theatre (east of Highland, just north of Santa Monica Blvd) 1157 North McCadden Place, Hollywood CA 90038. 'Tis the season for spooks and horror, for the dead to walk and the insane to stalk the living. 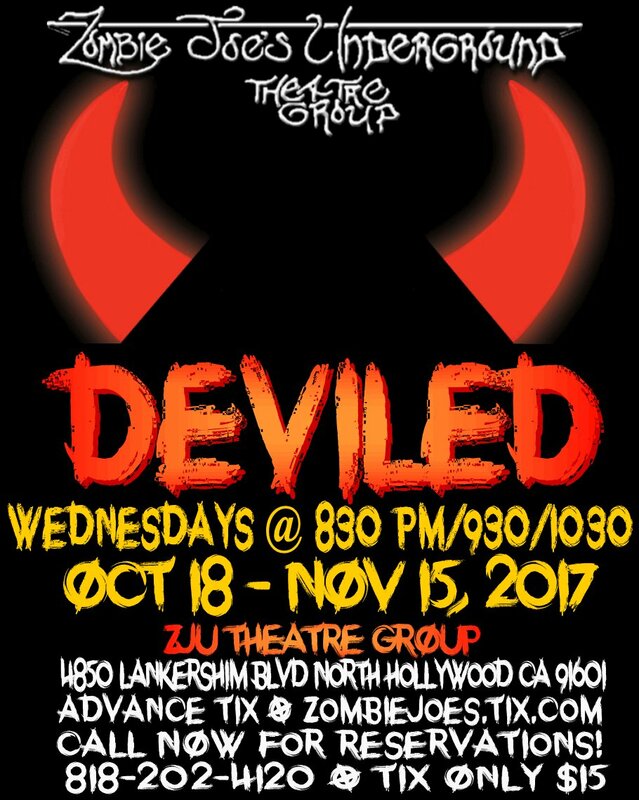 It is also time for Zombie Joe's Underground Theatre in NoHo to offer a tour of Hell. Well, of course. Deviled is precisely that. We the audience find ourselves greeted by...someone. Or something. Could be both. Anyway, our host offers a glimpse of something so long as the magical wards remain in place. Do not go beyond the wards he/it warns, lest ye never escape. Longtime ZJU fans may know what to expect next. They will be partially right. Many of the cast are ZJU veterans and various newcommers. Acts of the grotesque and disturbing make up the fare of what we see, but as ever this is not generic set of horror images. The earlier description holds -- a tour (or perhaps "glimpse") of Hell itself, that part of the afterlife consisting of cruelty. What follows lacks the raw shock of many works directed by Zombie Joe, as well as the simple horrifying details of those done by Jana Wymer. No, in this case Brandon Slezak goes after a landscape that remains totally disturbing on many levels right from the start. A place where dark impulses literally become the flesh and bone of its prisoners/inhabitants, where loss of self and degradation seem part of the air itself. Not simply because of random acts like a man trying to crawl away only to be found and raped by a silently gigging imp. Or the insectoid birthing scene almost everyone seemed to enjoy way too much. No, what really disturbed were those moments when what seemed like human souls were being awakened, invaded, warped. A ritual/dance/sleepwalking series of metaphormoses proved in some ways the worst -- what (presumably) were once human beings reshaped into monsters via an instinct to fuse their flesh together. Yeah, no clowns jumping out and yelling "Boo!" This makes for much more disturbing fare. 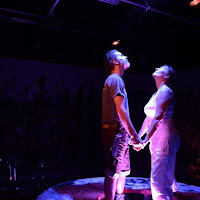 Please note the cast overall did a fine job, so kudos to Patrick Beckstead, Megan Combes, Michelle Danyn, David Dickens, Ian Michaels, Baba Njie, Brandon Slezak, Michaela Slezak and Claire Stephens. 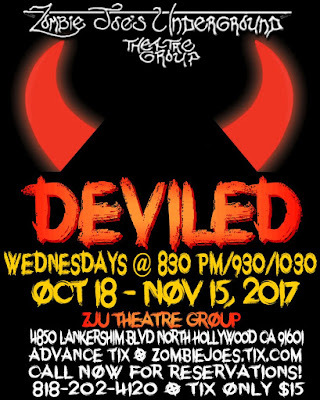 Deviled (which given the spelling really should be pronounced dee-VILE-d) plays Wednesdays at 8:30pm, 9:30pm and 10:30pm until November 15, 2017 at ZJU 4850 Lankershim Blvd (just south of the NoHo sign), North Hollywood CA 91601. Most ghost stories are about either Death or the Past. Sometimes both. The Past, pretty much because that is a definition of "haunted," as in the inability of the past to go away. It remains here, somehow still alive, unwilling to let go. Death, meanwhile, remains that "undiscovered country" from whom no traveler returns. The proof of our sentience, and its curse--we know this will be our fate. 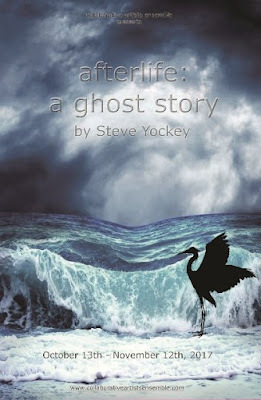 afterlife, a ghost story is about both. 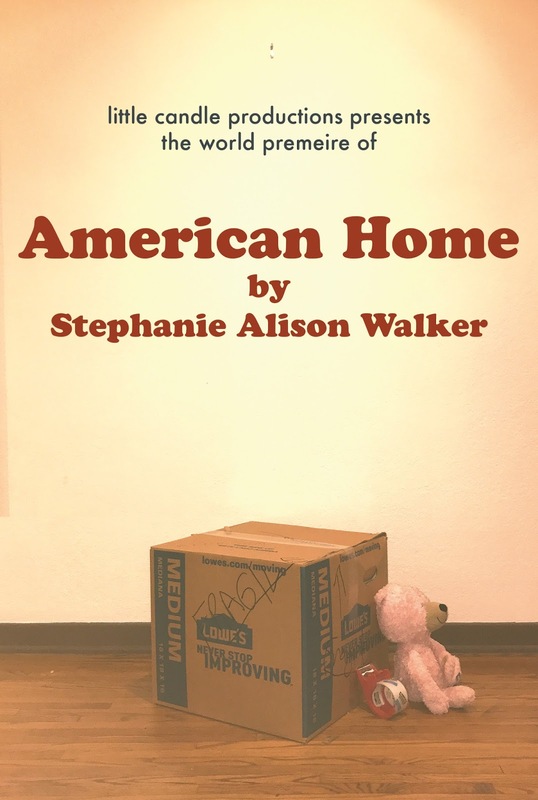 The play by Steve Yockey focuses on a married couple trying desperately to deal with the loss of their son. As a huge storm approaches, the visit their seaside house to lock things away. They haven't been back since their child was carried away by the waves. 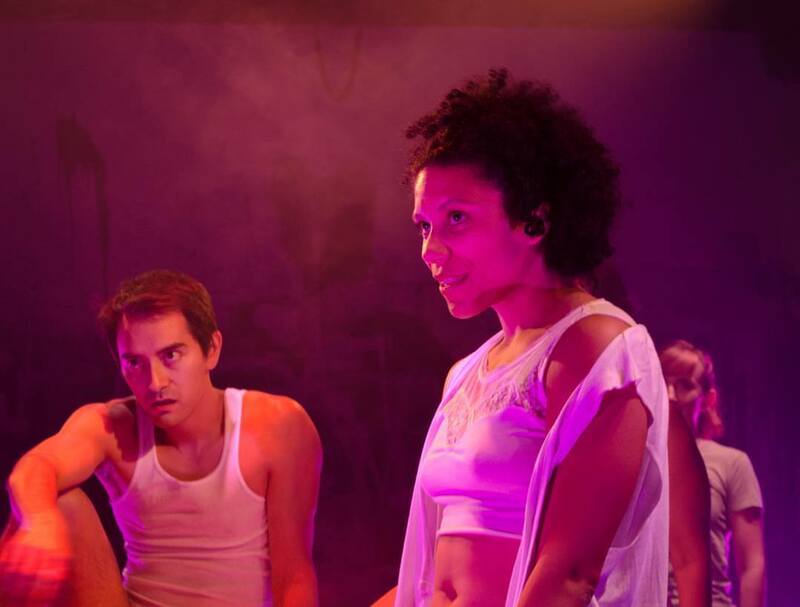 Danielle (Meg Wallace) is distracted to put it mildly. She finds everything surreal, being back. She lashes out, wanders in her mind, tries so very hard to figure out how to process the grief. Her husband Connor (Joshua James Knightley) has tried, maybe found a kind of brittle peace, which makes him a figure of envy and outrage. Act One consists of the two revisiting the past, remembering their past love of the sea. Both realize something very odd is going on. The island is almost deserted, hardly surprising given the warnings about a major storm on the way. But why are there so many dead fish on shore? More, where did these weird black birds come from? It all seemingly starts to really unravel when Danielle on her own, looking out to the sea, utters a venomous monologue about how much she hates it. The hungry waves that took her child and does not care. The endless churning waters eventually taking all things. How Danielle loathes it! Despises that which took her child! Wants to be with him so badly she even offers to let the sea take her, right now! Connor saves her, this time. As the storm rises, it proves far more powerful than they imagined. They start to flee in terror...! In Act Two we begin to meet others, although where precisely they (and we) now are isn't precisely clear. There's a Young Man (Buddy Handleson) who keeps writing letters to his father and mother, promising he is trying to get back to them. He talks about This Place, where lots of strange people live, and weird boats traverse the waters between different islands. Oh yeah, there are also the Black Birds -- pushy, ominous things that keep trying to get into his little house. Danielle finds herself in what seems like a house. Or maybe just a room. 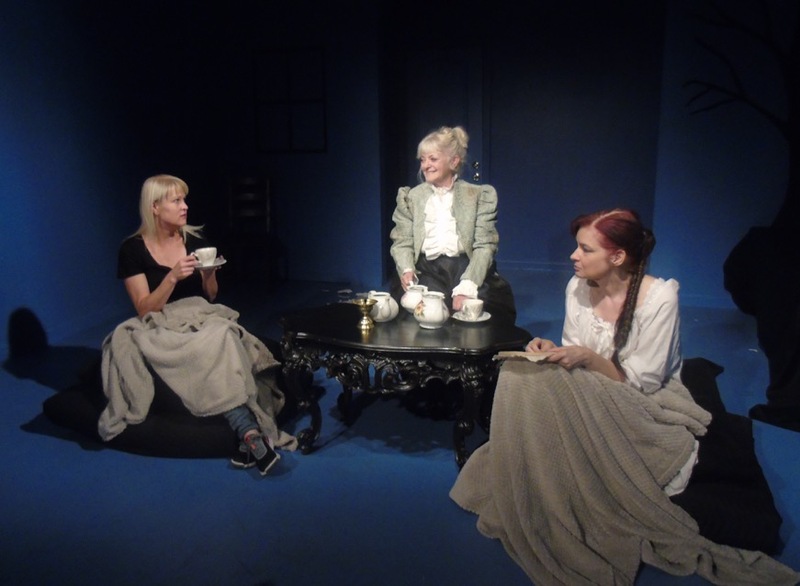 The Proprietress (Mary Burkin) offers her tea, while at her side a half-mad Seamstress (Georgan George) laughs at inappropriate times. The Proprietress explains she's likely going to be here a long, long time and she should plan as well as behave accordingly. We soon figure out--or are more-or-less informed--who (or WHAT) the Proprietress really is, while the Seamstress seems to have rather a lot in common with Danielle. Honestly the whole play reminded me of a long (and good) episode of either The Twilight Zone or maybe The Outer Limits. Director Steven Jarrard said this was his goal and he certainly achieved it! The whole cast and crew did! But most of all what they all achieved was an eerie fable, not unlike one of the earliest versions of classic fairy tales--the ones that lack anything like a simple answer obvious at first reading or hearing. Many might find the play comforting. Others might react by becoming upset. Maybe both. Which by this writer's standards qualifies as a compliment! At heart it comes across as a very personal encounter with the Uncanny, the transcendent which hints this world as we see it makes up such a tiny bit of reality. Ask a modern physicist for details about that if you seek some enlightenment stirred into with more than a few drops of fear. afterlife: a ghost story plays Fridays and Saturdays at 8pm, Sundays at 7pm until November 12, 2017 at the Avery Shrieber Playhouse, 4934 Lankershim Blvd (south of Magnolia), North Hollywood CA 91601. One random incident. The culmination of a thousand thousand such. Such makes up our lives, for good and ill and all things in between. Is there meaning there? Or do we create meaning? Does that even matter? 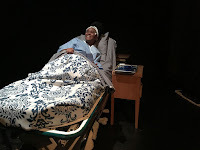 An Accident is the second show I have reviewed by the Griot Theatre, and hopefully will prove nowhere near the last. Both times I've felt deeply moved, as well as startled by the vision presented. Even the set sucked me into the world of this show. I walked into the theatre and nearly stopped dead in my tracks to look at the stage. A hospital bed on one side, with what looked like an earth and root system hanging above, as if a hospital room were underground somehow. On the other side, a garden complete with raw soil in a box, with a bench. Above this side, an abstract of what looked like wallpaper shredding/blowing away, in a paisley pattern mirroring the hospital bed sheets. In between, a small pedestal holding a pretty blue glass bottle. Could not take my eyes off it. What this might mean, I hoped and trusted the performance to reveal (and kudos to designer J.R.Bruce for this impact). Soon enough, we begin to meet the characters. Libby (Kacie Rogers) wakes up after a terrible accident. She was hit by a car then run over. She cannot move. Her arms and legs will not obey. For the moment she is broken. Perhaps forever. As we meet her, we see the powerful will and imagination she clearly possesses, and courage as she strives to remember anything, even her name. Next we meet Anton (Kent Faulcon), the history teacher who ran her over. A somewhat timid man, and a far from bad one. No one knows who "Libby" might be. No one has come forward. She has no visitors. Well, no one but Anton, who feels a need. The police do say this was an accident. No one's fault. Anton and Libby both accept this, intellectually. They struggle mightily with feeling it. 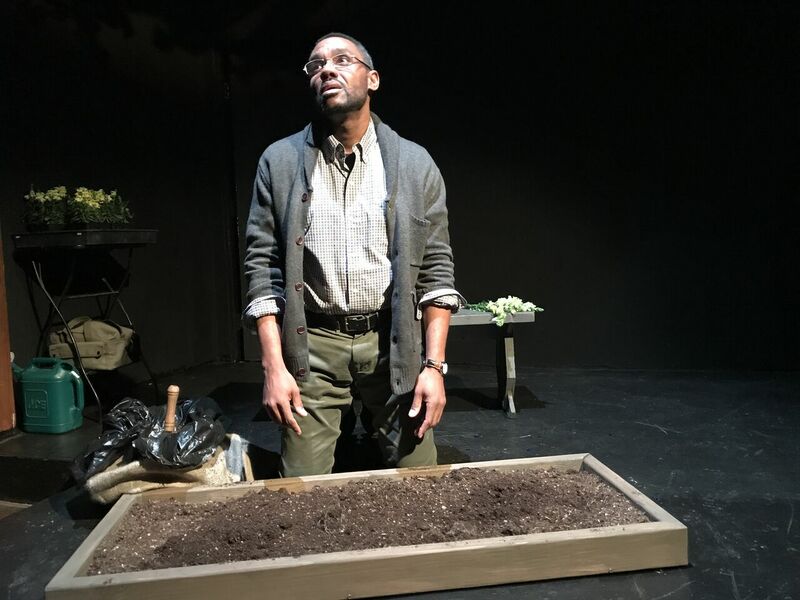 Here is much of what gives this play its impact, the deeply personal struggle of both to live with and process what has happened and is happening. In fact both have the same goal, healing. Both always want Libby to walk again, to regain her memories, her former life whatever that may be. Along the way we get little if any sentimentality. Libby comes across as an interesting person, a remarkable one. But hardly a kind of beautific saint or martyr. She's angry! Sometimes. She can be petty, terrified, sublime, cruel, childish, enraged, sarcastic -- all within a few minutes. Trauma doesn't mold one into a plastic shape of an angel. Instead she remains wonderfully, frustratingly human -- as does her opposite number, who needs some healing of his own. A good man, but again in no way some caricature of what some say humans should be. No, like Libby, Anton remains a person we recognize, to whom we listen and can understand, such understanding helping us see ourselves. That captures the dynamic of the play. I don't usually care for plays that seek to answer questions. They all too often become rather crude polemics. An Accident avoids this trap by exploring a question rather than simply answering it. That question "How do we heal?" 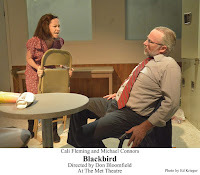 of course has many answers, and the play shows us a few -- not formulae, not pat stereotypes urging us to shut part of ourselves off, not thoughtless truisms. Rather shows us two people healing. And in touching our hearts maybe helps us heal a bit too, from the individual aches we all endure, whatever the details. I left the theatre very touched, very moved, and very impressed. An Accident plays Fridays and Saturdays at 8pm, Sundays at 3pm until October 29, 2017 at The Lounge Theatre 6201 Santa Monica Blvd (one block east of Vine) Los Angeles CA 90038. Captioning available on Oct 21. 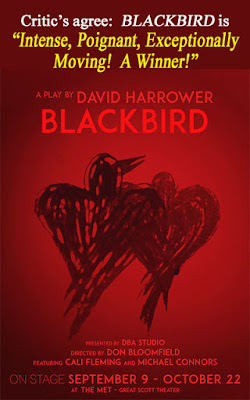 Go see this play. It will hurt and move you, and open up images as well as possibilities you (hopefully) have never experienced. The performances will sear you, make you a different person. Don Bloomfield directs this two character play, which lasts about ninety minutes without an intermission. The space proves intimate, almost uncomfortably so. One very nearly smells the set. In a litter strewn breakroom somewhere (in a business that fills some kind of pharmaceutical orders, we are told) a middle aged employee (Michael Conners) finds himself confronted by a young, attractive woman (Cali Flemming). It is night, with folks working overtime to finish something. The man is clearly terrified and using indignation as a kind of shield. Fairly passive-aggressive right from the start. The young woman only just learned where to find him. We soon learn the name he uses now--Peter--is new. He had to change his name. They both know why. We don't until she asks a horrific question. How many other twelve year old girls have you fucked? When he answers (which takes a little while) he says "Only you." Now we know where we are. This man sexually molested her as a child, and she needed to speak with him. She does not know why, but the reason seems clear enough, at least on a visceral level. Una (that is her name--which we don't learn for quite some time, an interesting and disturbing detail) all too obviously has not finished processing what happened. Many, many things have been left unsaid. Likewise many thoughts never allowed to reach the surface, emotions never given their time to vent, facts never fully faced. For her, maybe for him. And so they meet. They talk. We get a lot of details of what happened, with squirm-worthy but not salacious detail. Hardly anything about the act. But the prelude, yes. Even more the aftermath. Not least how each now views what happened and what they day say to each other or even themselves. It feels not only honest, but raw. With a full gamet of what such an event might inspire and churn up in terms of the human heart. Pity, rage, self-defense, compassion, tenderness, despair, confusion barely begin to describe what we see, what we learn, what we continue to see and learn for ninety minutes. One of the most powerful things any performance can do is shock and surprise the audience by showing what we realize in retrospect must have been inevitable. 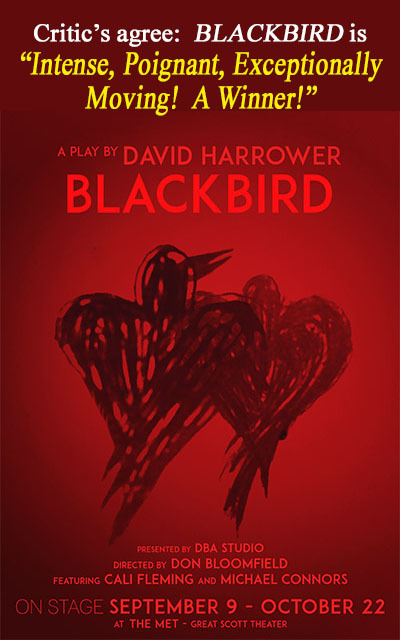 Blackbird does this, again and again and again. I even turned away more than once, because the power of this play became so real. This is a tribute not only to the script but the direction and especially the amazing (as in "brave" and "skilled" as well as "talented") performances. 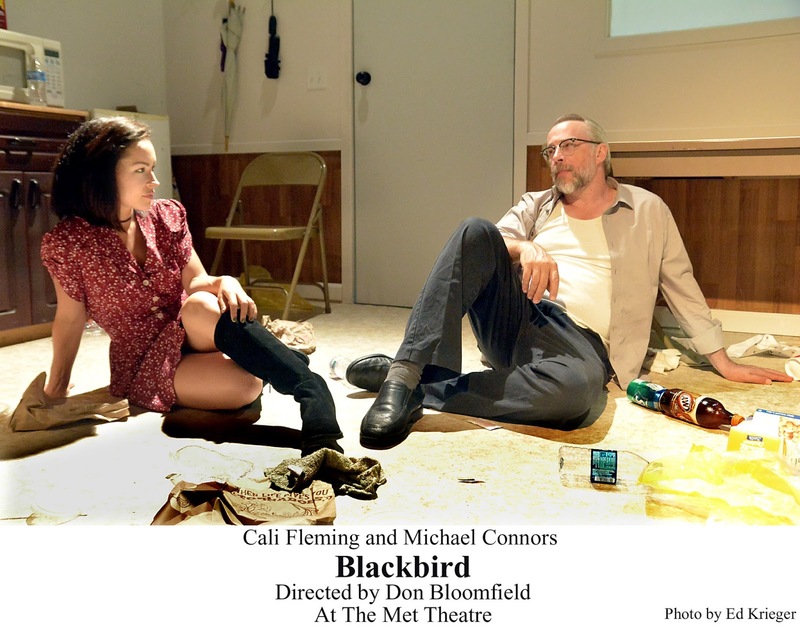 Blackbird (the debut solo production by the DBA Studio) plays Fridays and Saturdays at 8:30pm and Sundays at 3pm until October 22, 2017 at the Met, 1089 North Oxford Avenue (at Santa Monica Blvd, one block east of Western Ave.), Los Angeles CA 90029. 2017 is the Year of Macbeth, and we can all see why. The election. Many productions have explicitly stated this, either officially or face to face. 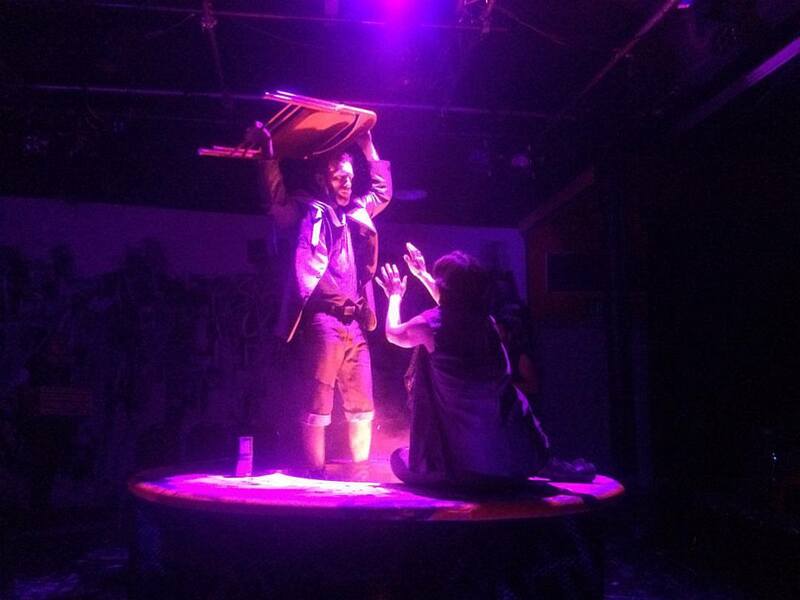 This MACBETH is at the Studio/Stage on Western Avenue (see below). Inevitably it revisits a least a few ideas of other versions this last year, most obviously in a post-apocalyptic setting. One might think after half a dozen versions of the same play I'd be bored? No. Because these have been good productions, each with a vibrant identity and surprises of their own. Surprises? 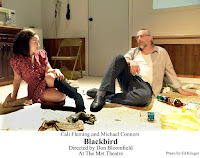 From productions of the same play? Yes! 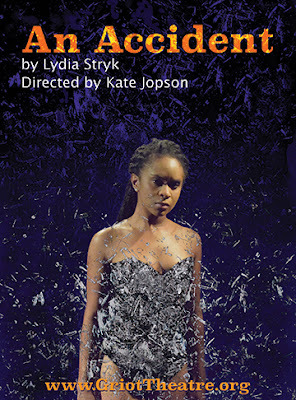 Quite apart from difference in individual performances, a vision (from director Curtis Krick) guides this production, a vision which has its own arch comments about power and politics but remains anchored to personal tragedy on many, many levels -- but mostly, the tragedy of Lord and Lady Macbeth themselves. Yes, they do terrible things. They destroy lives with wanton cruelty. But among their victims are themselves. Along the way a lot of startling, intriguing decisions take form on stage (a weird round structure center stage, at various times a bed or a table or a cauldron or a hill). 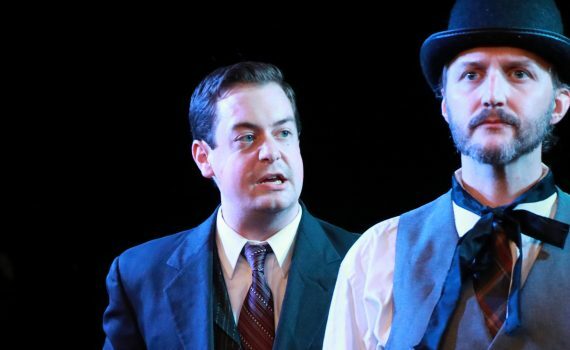 One, indicative of this world in which we find ourselves, lies in the repellent nature of both King Duncan (Sean Hilferty) and his son Malcom (Liam Cronin). Many Macbeths build on the idea of restoring order in the wake of an evil king. This production does a darker take, in which the world itself is corrupt, which itself is part of the tragedy. Likewise when we meet the Witches (Toni Del Sorbo and Jamel Corban Caldera) we meet a beautiful man and woman, with whom Lady Macbeth (Dawn Alden) has clearly made a pact on behalf of her husband. A delicious, almost shocking twist! More, this twist is at the heart of the most original thing about this production. In a unique turn, their marriage becomes even more of the heart of everything that happens. We know Lady Macbeth has given birth. Here we get a sense of an agonizing history behind that fact -- she has failed to give her beloved the son he so desperately wants and needs. In a medieval setting this makes for disaster. Since she cannot give her Lord a child, she gives him prophecy instead, doing all she can to win for him power, prestige, a throne and crown! Later, poignantly, she tries to help him escape in the only way that remains now that he lives dishonored, despised, surrounded by enemies and slowly going mad. 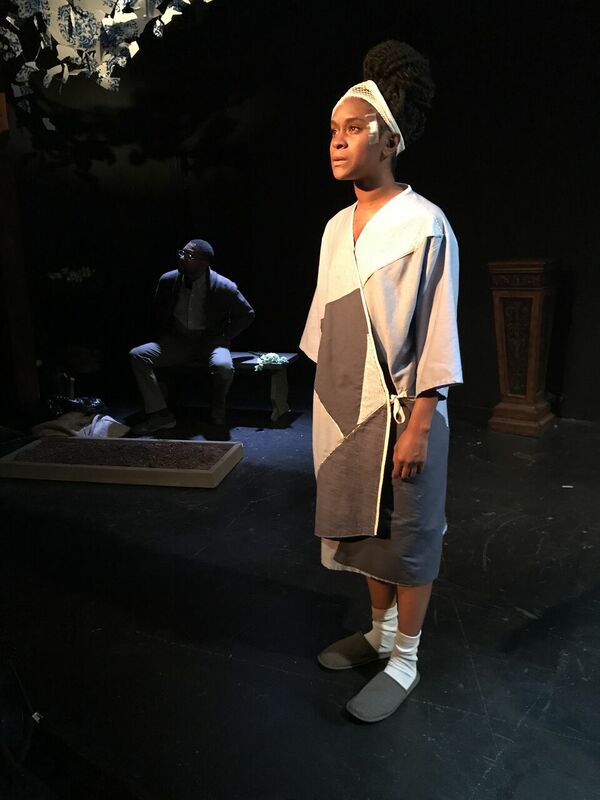 This Macbeth (Bryson Jones Allman) upon hearing news of his bride's death, feels this as the worst of all possible calamities. Almost a natural climax of the cycle of grisly disasters that have become his life and reign. His wife even haunts the widower, allowing yet one more embrace, one more moment of comfort. Before the final slaughter, the blood-caked end of all things. This Macbeth tugged at the heart, amid the very real horror. It tells the same old tale, but anew and makes it fresh to our eyes. Seems churlish to ask for much more. Okay, the font in the program was hard to read. But other than that...! Kudos also to the rest of the cast: Elvinet Piard, Nicholas Teizeira, Alvaro Renteria, Mona Lutfi, Sean James, Amanda Noriko Newman, and Kurt Kanazawa. 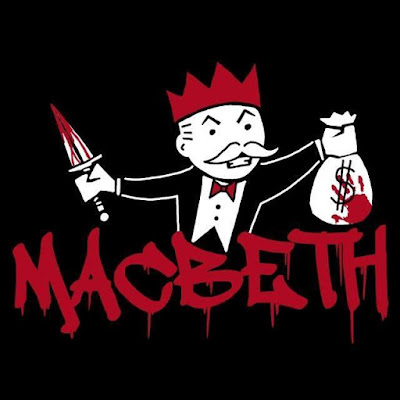 Macbeth plays Thursdays, Fridays and Saturdays at 8pm through November 4, 2017 with a special Halloween performance at 10pm on October 31, at the Studio/Stage 520 North Western Avenue (about two blocks south of Melrose), Los Angeles CA 90004. If you possibly can, try not to think at all about the 2012 motion picture of the same name. Really. Yes, the two are based on the same novel, and bear some genuine resemblance. 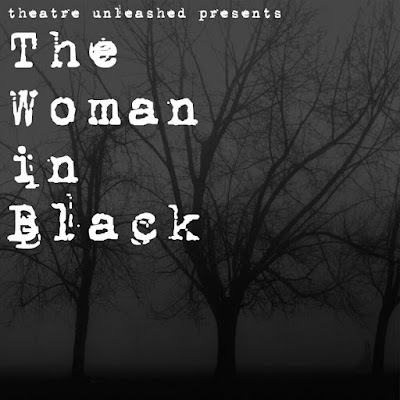 Yet you will have a better, more wonderfully terrifying experience if you forget about the movie (or even the book) and simply watch this play, The Woman in Black by Stephen Mallatratt based on the novel by Susan Hill. Walk into the theatre expecting only what the adverts say "a ghost play" and you will have the best of times. To be fair, you'll enjoy it a lot even if you don't, but that would be the best way. At least if the idea of genuine horror appeals. No jump scares. No obvious trickery. No cheap thrills. Rather, a gathering mood of terror, or the uncanny right there and not to be dismissed. Spencer Cantrell and Adam Meredith tell the tale. Or rather, they enact it. Rather than pretend this is some kind of realistic recreation of things like Edwardian London or a huge old house amid marshlands, what they do is what Shakespeare calls "on your imaginary forces work." Sound and suggestion create everything. Mr. Arthur Kipps (Meredith) is a retired solicitor, one with something in his past that needs telling. Or maybe the better word is "exorcising." He has sought out an actor (Cantrell) to help him explain what happened, to help him make it real. So the two of them go about precisely that. Kipps as a young man had had the job of going through the personal belongings of an elderly woman who had lived pretty much in seclusion for decades, within a mansion called Eel Marsh House. A simple enough task, one would think. If it weren't for the title character, the woman who attends the funeral of the late woman, yet never says a single word. 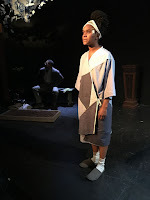 I should mention here the direction by Jacob Smith does wonders amidst all this, because the trust placed into the two man cast coupled with little more than the words of the script achieve wonders. Ann Hurd's amazing set design (really, she did spectacular job) and Graydon Schlichter's sound design as well as Gregory Crafts' lights do it all without a drop of blood, without a single special effect, without anything or anyone popping out of a wall or piece of furniture. 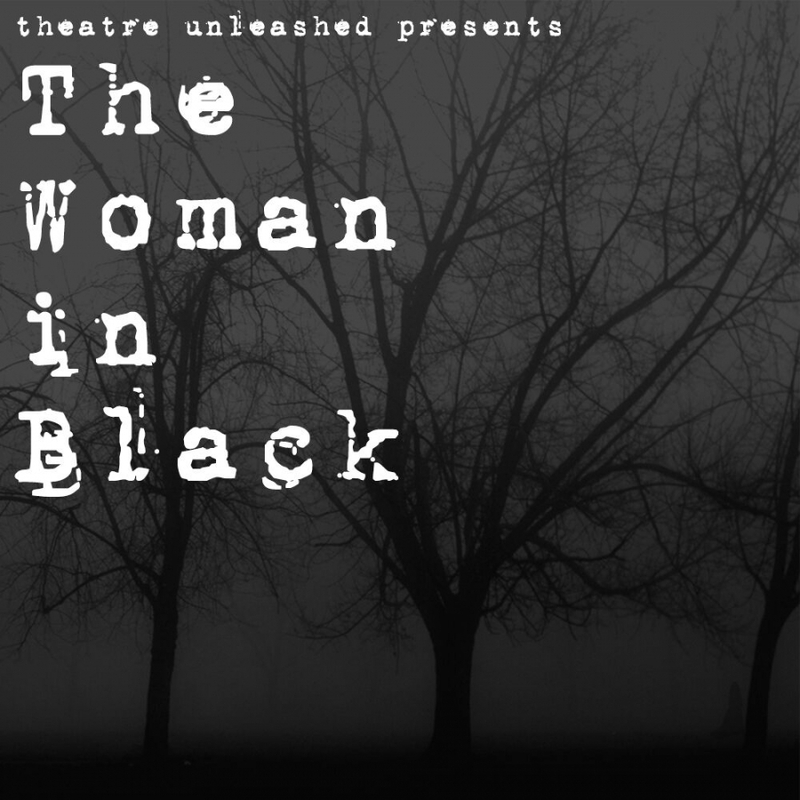 The Woman in Black plays Thursdays through Saturdays at 8pm, through November 4, 2017 at the Belfry Stage, upstairs at 11031 Camarillo Street (just west of Lankershim) North Hollwyood CA 91602. Quick note: This review is quite late. My deepest apologies. We forget things. Sometimes little, sometimes huge, plus all sizes in between and out to the side. We make assumptions and they all too often prove wrong. Sometimes this can almost destroy us. All it takes is a few things to go wrong, maybe. We don't like to consider that fact. Rather we as a people like to assess blame, insist on assigning responsibility, then pretend once that is done the problem has been solved. Of course that is itself wrong, or at least wildly out of tune with reality. 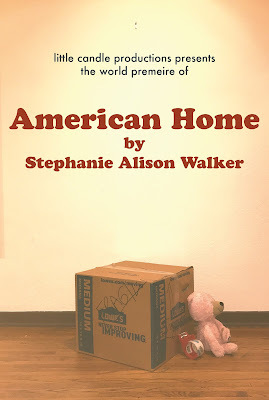 Stephanie Alison Walker's play American Home gives a vivid portrayal of exactly that -- a series of assumption in fact many of us saw happen, knew folks who suffered from a collective series of errors as well as pure bad luck. Its focus is on the housing crisis which pretty much began in 2008 with the economic downturn, and which echoes with us yet. Done in a kind of modified Reader's Theatre format, the play mostly deals with three sets of characters dealing with the loss of their homes. 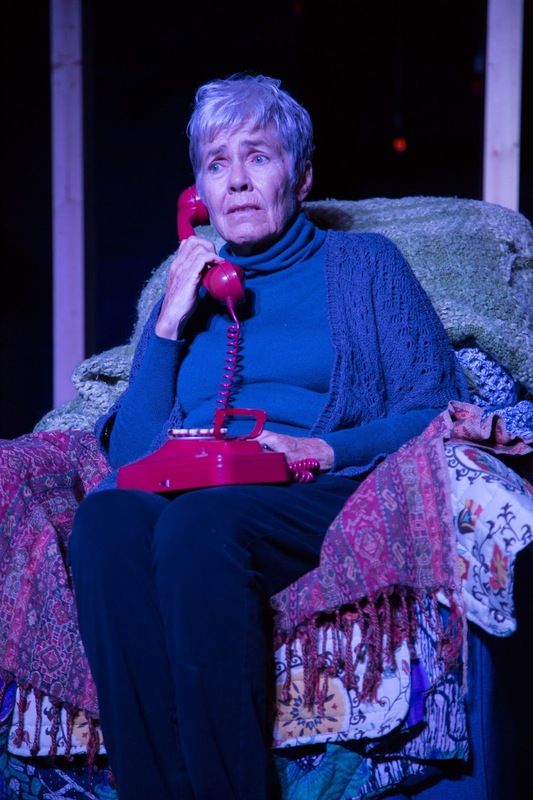 First is an elderly lady (Bette Smith), a widow confused by events and stubborn in her pride, even though she has at least one friend left -- a police officer who warns her of what will follow if she cannot make payments. Second we find a young, happy married couple (Jono Eiland and Ozioma Akagha) who long to find a home and start a family. At last, after months and months of searching, they find exactly what both want, the dream HOME. Almost immediately the husband loses his six figure job. Nobody's fault. Just the economy. His boss genuinely doesn't want to let him go, feels dreadful, knows the young man just bought a house. On top of this, of course the couple learn they are pregnant. I gather what happened to this couple is more-or-less the story of the playwright and her husband. This isn't needed to appreciate the play, but does add some extra dimension to it all. A tiny extra twist of the knife. 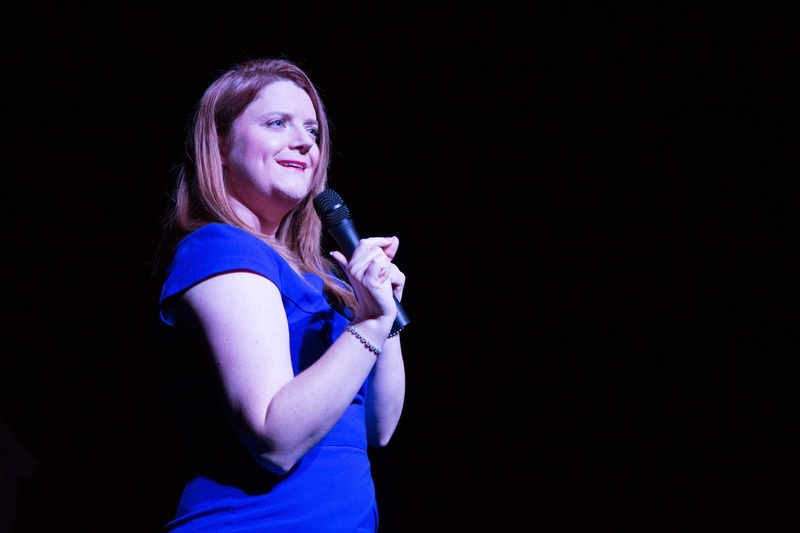 Third we find a prosperous woman (Jessica Kaye Temple) with a successful personal ministry, teaching what has come to be called "prosperity gospel." She says Jesus wants you to be rich and comfortable, that with enough faith and work you will be, that things turn out all right just because Jesus really does love you and so he bestows financial security upon the faithful as a natural consequence. For the record, I have a hard time imagining anything more blasphemous that doesn't involve breaking the law. Her relationship with an early follower, a good friend who takes all her advice, proves especially heart-breaking in some ways. Yet in a nice surprise, we also see some hope, some ability for change in this woman. She has been a fool, not a malicious liar. 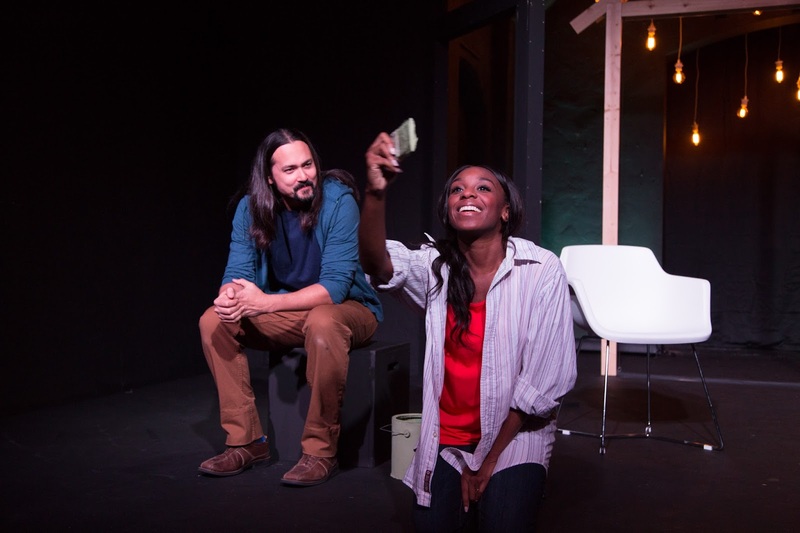 In fact the whole play--full of zingers and insights as it is (including a lot of valid commentary about how we treat tragedy in our media, seeing and demanding it be presented as a morality play)--contains some vivid gems of hope. The old woman does have a friend, who helps. The couple reel in psychological chaos following this disaster, but do not self-destruct. The minister shows genuine compassion, even humility in the face of being wrong. Hope. A valuable thing. Even beautiful and when you take a good look around, not nearly as rare as it might seem. I must also applaud the show for ending on perhaps the most important reason of all. Why? Why do we as a nation invest so very much passion and even identity in the idea of owning a house? Let us all try and answer that one. Sadly this show has closed but I urge everyone to keep an eye on this theatre company Little Candle Productions and the playwright Stephanie Alison Walker, the director Kate Woodruff as well as the entire cast who did exemplary jobs throughout: Jennifer Adler, Ozioma Akagha, Marc Barnes, Jono Eiland, Mel Green, Ethan Rains, Bette Smith, Jessica Temple, and Caroline Westheimer.